Fear and loathing in Kiev is about to enter its 7th week. Crimea is now "officially" a part of Russia, at least as far as Russia and what is claimed to be the vast majority of those living in Crimea are concerned. With this in mind, let's get caught up with what is going on in and around a region in crisis. General Breedlove, NATO's supreme commander, has come out and said that there is so much firepower on the Russian/Ukrainain border now, all of it "spun up" and waiting for orders, that it would only take twelve hours from when an order was given for an invasion into Ukraine proper to be underway in full. The full taking of Ukraine by Russian forces is currently handicapped to take about 3-5 days. At least 40,000 troops are now garrisoned on Ukraine's Eastern and Southern flanks. Along with them are hundreds of tanks, artillery pieces, armored personnel carriers and a pocket armada of air power. In other words, Putin's blitzkrieg in waiting is "locked and loaded," and appears to be waiting for orders. This comes after Moscow had apparently sent multiple signals, including a direct phone call between Germany's Chancellor Angela Merkel and Putin himself, where he promised that his forces would be substantially withdrawing from the border of Ukraine. Surprise, surprise! No such withdrawal has occurred, just a couple hundred Russian troops were shuffled around. Meanwhile, as olive branches are flung, Russia has removed its NATO military liaison after NATO cancelled all its cooperation and training events with Russia in protest over its invasion of Crimea. With this chilling of military relations between the powers that be, we have also seen a strategy slowly emerging regarding the reinvigorated Russian Bear, it is a very familiar one called containment and isolation. Ukraine has recently agreed to participate in elaborate war games with NATO and US forces that are currently bolstering NATO's capability around Europe's eastern flank includes about a dozen F-16CMs sent to Poland, 10 F-15Cs sent for the biggest Baltic air policing mission ever in Lithuania, as well as tanker aircraft, a newly added E-3 AWACS and an AEGIS class Destroyer that will continue to provide a US Navy presence in the Black Sea. Putting a single Arleigh Burke class Destroyer in the Black Sea may be a token show of force, but seeing as that pool of water may be the largest enclosed anti-ship missile engagement zone in the world, a single Destroyer is hardly a survivable asset should tensions between the NATO and Moscow turn from chilly to boiling. On the even more belligerent economic battlefield, Putin's Russia is now making it very clear that it plans to use its energy resources as a weapon. Russia has torn up the lease agreement that kept Russia's Black Sea Fleet's Crimean headquarters in place through at least 2017 in exchange for premium pricing on natural gas imports to Ukraine. What is worse is that Russia in now seeking restitution for the discounted gas provided during the active term of the lease, a bill in excess of $11 billion dollars! In addition, Russia want's Ukraine to pay immediately for over $2 billion in recent gas exports, and going forward the price for energy from Russia will be 80% higher than it once was. This news, along with the general economic uncertainty that hangs over a semi-revolutionary and semi-besieged Ukraine, has resulted in the major credit agencies classifying Ukraine's credit worthiness as "default imminent." All this amounts to economic total warfare Putin style and may result in a total collapse of the Ukrainian economy. Ukraine has lost a good part of its Navy, Air Force and some relevant ground force material and personnel during the Russian "annexing" of Crimea. At least four dozen MiG-29s, although the majority were unserviceable, were lost when Russian forces finally took Balbek Air Base on Crimea's western shore. With this and the looming threat of a wider invasion in mind, Ukraine has begun attempting to put its mothballed MiG-29 Fulcrums back in the air. Only about 15% of Ukraine's attack helicopters and fighter/attack aircraft are capable of operations. What is even worse is that only about 10% of flight crews are proficient in employing their aircraft as a weapon system. This is hardly good news considering that the Russian hammer and anvil is standing at Ukraine's backdoor! Ukraine did not only lose dozens of aircraft, warships and land vehicles to Ukraine after Russia's invasion of the Crimea Peninsula, it also lost its combat dolphins. Ukraine's combat dolphin program, which was established in the 1960's, was slated to be shutdown this month, but Russia's military seems to have taken great interest in the capable sea mammals, and will integrate their capabilities into the Russian Navy. Just like America's military mammal program, these dolphins are trained to look for mines, enemy divers and submarines, and they are very effective at doing so. Just one dolphin and a small crew in a skiff can do the work of an entire military ship in regards to some underwater detection missions. Although America has denied the possibility that their combat sea mammals can plant mines on ships or attack enemy divers on command, Ukraine has never made such a statement or claim. 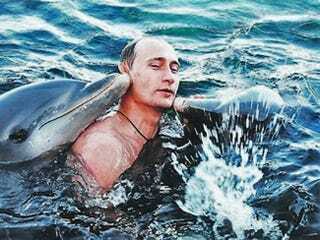 Although they are not "sharks with freakin' laser beams," combat dolphins are an effective and unconventional capability, and now Putin has them all to himself. The airspace over Crimea, and the northern Black Sea for that matter, has become quite complicated as Russia has now declared that much of this airspace will now be under its jurisdiction. This is in conflict to international norms which recognize the airspace as under Ukrainian control. Thus the European Flight Safety Agency has warned pilots and air carriers to avoid direct over flights of Crimea. This is probably very good advice as ambiguous air traffic control situations, a territory in turmoil, and surface to air missiles never mix well, and from what has been reported, Crimea and southwest Russia are now brimming with S300 and possibly S400 air defense batteries. Finally, in startling news, Darth Vader is apparently running for President in Ukraine. He is to have quite a following, including his Royal Guard and an old friend, Darth Maul. And you thought that America's Presidential Elections were a circus!